"These crops have stopped us from asking debts from our already vulnerable relatives. They have not received their salaries for over a year, and all of us are affected due to the conflict in my city, Taiz. The crops also did not cost me a Penny for effective and healthy inputs; I water them with the kitchen waste water and use locally made organic fertilizers sent to me from my village and use the powder garlic and orange peels as pesticides." This statement by widow Samar Mohammed summarizes the change that the SFD CfW-supported home garden has triggered to her and her three children’s lives. Having created her own garden, Samar bought from labor wage a door to protect her garden and a sewing machine to start a new project that generates income. 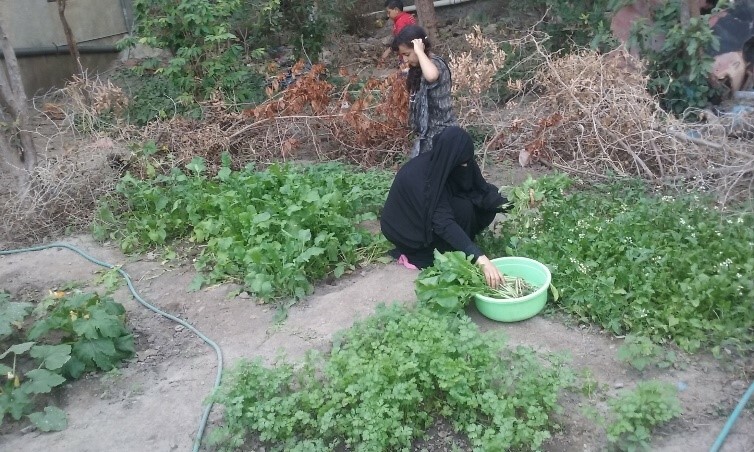 The YECRP has introduced the home garden activities as a new activity that has helped several conflict-affected households in Taiz survive the hard access constraints into their city. As the home garden has been supportive, Samar has voluntarily expanded her garden by three times cultivating new kinds of vegetable. The garden has alleviated part of Samar’s suffering as her husband was killed during the fighting in the city in 2016 and became the only bread winner of her three children in a city free of any job opportunities, while the food prices keep rising and her children keep demanding their needs.